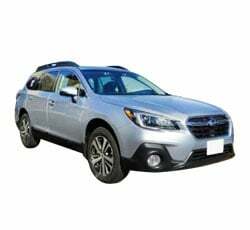 If you want a crossover between a station wagon and an SUV, then look no further than the 2019 Subaru Outback. This vehicle combines the best of both worlds with its rugged off-roading capabilities, comfortable interior, and abundance of cargo space. While the base 2.5-L engine is less-than-thrilling and the low grip limits with the handling are problematic, some drivers will have no problem overlooking these issues and enjoying the many standard safety and infotainment features that the Outback has to offer. As part of the fifth generation of Outlooks that was introduced back in 2015, there has not been a lot of need to change things on the 2019 Subaru Outlook. However, Subaru has seen fit to make some subtle but important changes that help it keep pace with its competitors. This year, the Subaru EyeSight suite of advanced driver aids comes standard on all trim levels, which makes the vehicle even more worth the price. Also, the base 2.5i trim level now comes equipped with two USB charging ports instead of one. Other than that, only some minor changes to the vehicle's style have been made but are hard to distinguish from the 2018 line-up. Those looking for a wagon that has strong off-roading capabilities will be pleasantly surprised by how well the 2019 Subaru Outback handles going off the beaten path. With the help of a well-tuned all-wheel drive independent suspension that comes standard on each trim level, this wagon can easily transition from scooting about town to a rugged performer on mountain roads. At its very lowest point to the ground, there is 8.7 inches of clearance, which is one of the best in its class. Despite some noise from the wind and tires, the interior of the Subaru Outback is extremely comfortable. Long car rides are relaxing due to the well-bolstered seats in the front and rear, all of which provide plenty of lumbar support. The driver's seat is equipped with power-adjustable lumbar settings, which is a nice bonus for those who log a lot of hours behind the wheel. The wagon's suspension offers a smooth ride, and it's hard to feel dips in the road or speed bumps. Station wagons and SUVs are always desirable for their amount of cargo space, and the 2019 Subaru Outback provides plenty of it. With all seats in place, you get 35.5 cubic feet of cargo space. This can be maximized by folding the rear 60/40 split rear seats (which have both side and rear release handles), which gives you a total of 73.3 cubic feet of cargo space. Getting cargo into and out of the cargo area is easy due to the height of the vehicle, which Subaru gets just right. It is also easy to load things like bicycles onto the roof rails. This gives the Outback the competitive edge over SUVs, which tend to be taller, making it more difficult for most people to load anything onto the roof. The 2019 Subaru Outback has slender roof pillars both up front and in the rear. This allows for an impressive amount of visibility for the driver that extends around the vehicle. Drivers will also benefit from having massive windows in the rear as well as large side mirrors, as this allows the naked human eye to get a good visual on the vehicle's sides without relying heavily on blind-spot monitoring features, although blind-spot monitoring does provide an extra bit of security while driving. Steering on the Subaru Outback has a relaxed and natural feeling to it. There is never any question as to where the wheels are going to go when you turn the steering wheel. The steering does require some effort, but it is not tedious or exhausting. Turning through tight corners is also simple in the Outback, so getting around in urban areas and small parking lots is simple. Standard across the line-up this model year is Subaru's EyeSight, which is a bundle of advanced driver aids. The EyeSight system has a number of helpful safety features, including adaptive cruise control, lane departure warning with a sway warning function, pre-collision throttle management, pre-collision braking, and blind-spot monitoring with rear cross-traffic alert. These features alert drivers to potentially impending hazards while driving and offer peace of mind. The controls on the 2019 Subaru Outback are all easy enough to locate and use on the touchscreen display panel. The icons and images you get for these controls are all large enough to touch and are also easy to read. Drivers who are not terribly tech-savvy should not have too much hassle figuring out the controls, and nothing about the controls seems touchy or distracting while driving. Subarus are not luxury vehicles by any means, but the Outback certainly looks like it is made from high-quality materials that will be able to stand the test of time (and children). The interior materials are soft to the touch, and the cabin boasts some particularly pleasing trim. The body of the car also seems to be pretty durable. Drivers should not notice any awkward rattles or squeaks coming from the exterior even while going over rugged road surfaces or while off-roading. Many vehicles in this class have particularly low towing capacities. The 2019 Subaru Outlook outdoes many of its competitors in this aspect. The base 4-cylinder engine is rated for towing up to 2,700 pounds while the more powerful 3.6-L V6 engine can tow a total of 3,000 pounds. Those who plan on doing a good amount of towing will likely enjoy the power that the V6 packs while it is towing. The biggest drawback to buying the 2019 Subaru Outback is that its base 2.5-L 4-cylinder engine just is not that powerful. This engine is only capable of producing 175 hp, which does not feel like enough to get the Outback going quickly on the road. On the highway, the 2.5-L feels especially sluggish. In fact, the acceleration on this engine keeps it at the back of the pack among its competitors. The 2.5-L can only get from 0 to 60 mph in roughly 10.2 seconds. If swift acceleration is your thing, you will want to upgrade to the 3.5-L V6 engine that comes on the 3.5R trim. Handling on the Outlook could also use some refinement. When you make a quick and assertive turn, the wheels will offer up an obnoxious squealing noise. Since the suspension is not terribly firm, going around turns like this will produce noticeable body roll. This means drivers will have to take things rather steady on the Outlook in order to get a secure handling performance from the vehicle. While the brakes on the 2019 Subaru Outback can be regulated pretty easily, the brake pedal feels a bit too soft. Paired with the touchy gas pedal, this makes for some awkward alternations between stopping and going. The brakes do allow the vehicle to come to a safe stopping distance, but there is a considerable amount of nosedive that happens when brakes are quickly applied. The Outlook typically runs smoothly at normal road speeds, but when you get onto more jagged surfaces, you will notice the wind and road noise pick up. The 2.5-L engine has a steady hum to it that never seems to go completely quiet, and at a higher RPM, the engine will produce a good amount of noise that filters into the cabin. The 2019 Buick Regal TourX is one of the biggest competitors for the 2019 Subaru Outback. This chic-looking wagon looks a lot like its European counterparts and offers up plenty of cargo space. Its handling and base engine power both surpass what you get on the Outback, but the TourX lacks a lot of the safety features that come standard with the Subaru EyeSight suite. The 2019 Audi A4 Allroad is Audi's answer to the station wagon/SUV crossover design. This wagon upholds Audi's tradition of using only the finest materials throughout the cabin, and it functions well as an off-roader due to its suspension and high ground clearance. It also features a turbocharged engine that provides more power than what you can get with the Subaru Outback. However, the transmission seems to lag in low-speed driving situations, and the driver aids are so sensitive that they often have to be turned off so as to not be a distraction to the driver. The 2019 Subaru Outback blends elements of an SUV with those of a station wagon, making it a fun off-roader. The safety and infotainment features are plentiful and function well, and the interior cabin is comfortable in almost any situation. While the 2.5-L engine lacks get-up-and-go power, the 3.5-L packs more of a punch and is more suitable for those who want that quick acceleration speed.